Total Solar Eclipse will occur on 21 August 2017 with Sun and Moon in Magha constellation of Simha Rasi (Leo) according to Vedic Astrology. This eclipse will be visible over entire USA, Canada, Mexico, Central America, Caribbean Islands, parts of South America, north-west Europe and north-west Africa. Solar eclipse occurs when the moon passes between earth and the sun, thereby totally or partly obscuring the image of the sun for a viewer on Earth. A total solar eclipse occurs when the moon’s apparent diameter is larger than the sun’s, blocking all direct sunlight, turning day into darkness. Totality of eclipse occurs in a narrow path across Earth’s surface, with the partial solar eclipse visible over a surrounding region thousands of kilometers wide. This Solar Eclipse will begin at 15:46:48 UTC on 21 August 2017 and ends at 21:04:19 UTC, with maximum eclipse at 18:26:40 UTC. Entire duration of this partial solar eclipse is 5 hours, 17 minutes and 32 seconds, while duration of total solar eclipse is 3 hours, 13 minutes and 3 seconds. 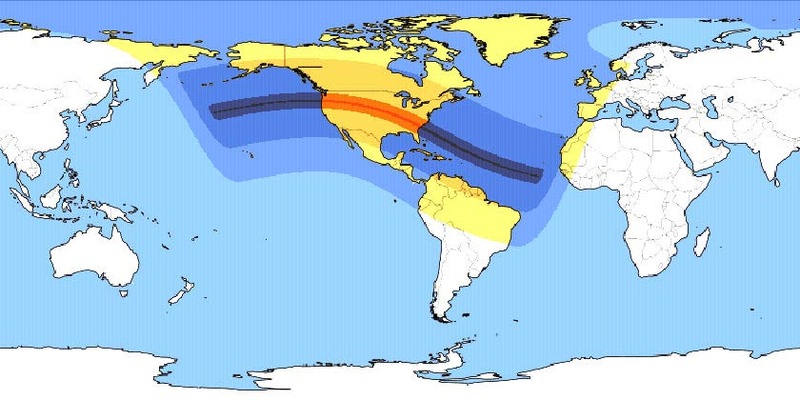 Countries falling under the colored zone in above picture can see this solar eclipse. Countries and places under dark colored zone can see total solar eclipse, while places under light colored zone can see only partial solar eclipse and places in white colored zone cannot see this eclipse. 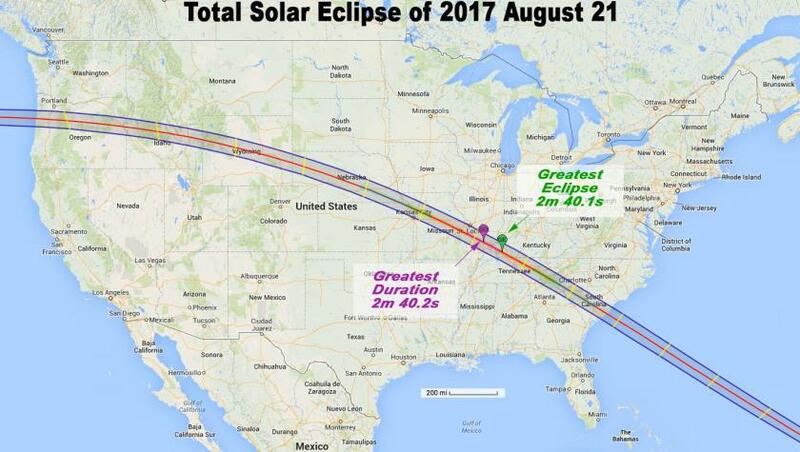 Total Solar Eclipse will have a magnitude of 1.0306 and will be visible within a narrow corridor 70 miles crossing 14 states of the contiguous United States : Oregon, Idaho, Wyoming, Montana, Iowa, Kansas, Nebraska, Missouri, Illinois, Kentucky, Tennessee, Georgia, North Carolina, and South Carolina. It will be first seen from land in the US shortly after 10:15 a.m. PDT at Oregon’s Pacific coast, and then it will progress eastward through Salem, Oregon, Casper, Wyoming, Lincoln, Nebraska, Kansas City, Missouri, St. Louis, Missouri, Nashville, Tennessee, Columbia, South Carolina, and finally Charleston, South Carolina. This eclipse is unprecedented in modern times in that 12.2 million people reside in the path of totality, and 88 million live within a day’s driving distance. Longest duration of totality will be 2 minutes 41.6 seconds at about 37°35′0″N 89°7′0″W in Giant City State Park, just south of Carbondale, Illinois, and the greatest extent (width) will be at 36°58′0″N 87°40′18″W near the village of Cerulean, Kentucky, located in between Hopkinsville and Princeton. Local time at Hopkinsoville will be 13:20 hours at the time of Maximum Solar Eclipse. This is the first total eclipse of the Sun visible from the contiguous United States (excluding Alaska and Hawaii) since February 26, 1979. The last time a total eclipse was visible from coast to coast was on June 8, 1918. Sun, Moon and Rahu will be in constellation of Magha and will be in close proximity with Mars in Aslesha constellation, while retrograde Mercury in Purva Phalguni nakshatra. This cluster of 5 planets (Sun, Moon, Rahu, Mars, Mercury) which are within 20° will be aspected by Ketu in Dhanishta nakshatra. These 6 planets (Sun, Mars, Moon, Rahu, Ketu, Mercury) will heavily influence both Aquarius, Cancer and Leo to bring few sleepless nights for those born in these signs. Mars being combust is not good for Aries and Scorpio moon sign born. Their self esteem will be low and guilt feeling will be high. Pressure will be mounting on them for past commitments made. Mercury being retrograde, squaring retrograde Saturn can lead to honest people bring cheated. Also retro Saturn in constellation of Jyeshta will lead to delay in delivery of karma. Only information will be recieved but results will be kept waiting. Mars on Aslesha nakshatra, trine Saturn is expecting you to get busy and avoid gossip. Sun and Mercury conjunction (retrogade Mercury and Sun moving towards each other) is good for fact-to-face conversations. Avoid online communication or calls. Just meet. Sudden attractions can happen for few and they will also fade away quickly. A Solar Eclipse occuring in sign of Leo, with its lord Sun occupying same sign, indicates political turmoil, threats and revolts against family rule, dictatorship. UK, Germany, France, Canada, USA will witness severe problems with immigrants. Internally, president Donald Trump will be facing heavy criticism and opposition. Natural Calamities will hit east coast of USA, South America, Mexico in next few months. This solar eclipse is good for people born under Moon Signs of Pisces, Gemini, and Libra. These 3 signs will experience good health, solutions to complicated problems being easily found and gain inner strength. If you are born with Moon in Awsini, Magha or Moola constellations, or going through Sun (Surya) Dasa, then expect major changes in life within 2 months. If you are born under Leo Moon sign or Ascendant or going through Sun Dasa, then it is time to take care of your health and relationships. This is the best time to write down what you want to do and wait until after Mercury Retrograde is over (September 5th). If you can’t wait, then do something really enjoyable that you haven’t done in a long time. 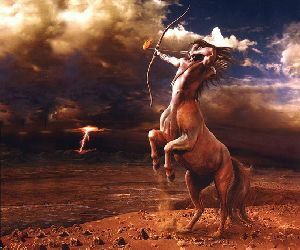 That way, you will be breaking routine (Uranus). Since you will be going back to something, you will also be in tune with the Retrograde.